When you are trying to plan a healthy diet, it is easy to look up the nutritional information for pre-made foods, even if you get the foods from a restaurant. 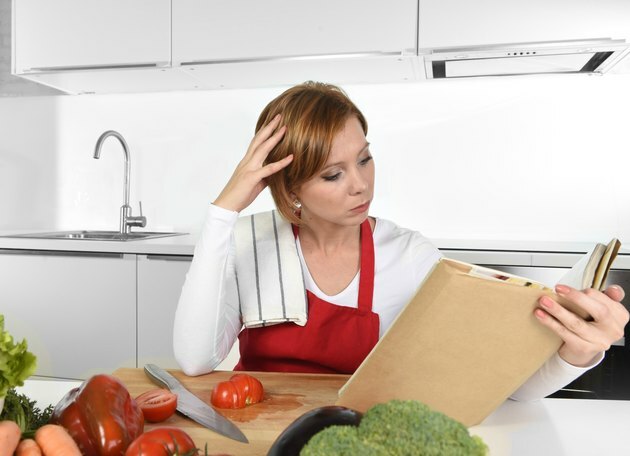 It can be more difficult, however, to determine the nutritional information for foods from a recipe. This is because foods that you make yourself do not have readily available nutritional information unless that information is included with the recipe. In order to get the nutrition information for a recipe, you will have to do your own calculations. Write down every ingredient in the recipe. You can do this on a piece of paper, but you may find it easier to enter this information in a spreadsheet program such as Microsoft Excel, particularly if you want to save this information for later, WorththeWhisk explains. Alternately, you can enter each ingredient into an online nutritional calculator, such as the one found at FitWatch. Note the quantity of each ingredient. Again, this information can be entered into a column on a spreadsheet, noted on a piece of paper or typed into the appropriate box on an online program. The method you use is up to you. Calculate the nutritional information for the amount of each ingredient. For many foods, this information will be contained on the ingredient's packaging. A standard food label will list the calories, fat, carbohydrate and protein content, as well as the amount of cholesterol and sodium that each serving of the ingredient contains. If you don't have the ingredient's packaging or there is no nutritional label, you can use an online database such as LIVESTRONG.COM MyPlate to look up the information. If you use an online recipe calculator, this step will be done automatically. Sum the nutritional information for all of the ingredients. This step will be done automatically with an online food calculator. Divide the total nutritional content of the recipe by the number of servings. Recipe nutrition calculators typically have a box where you can enter the number of servings that the recipe yields, which will allow the program to adjust the nutritional value for each serving.